GUWAHATI: The members of the Krishak Mukti Sangram Samiti will stage a two-day sit-in protest demonstration at Ramlila Maidan in New Delhi from November 20. Along with their various demands, the KMSS members will demand for immediate release of their imprisoned leader Akhil Gogoi. 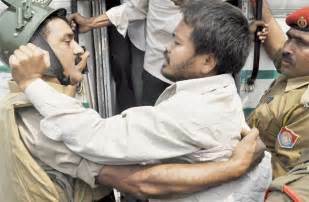 The KMSS leader Akhil Gogoi was picked up from the Golaghat office of the Krishak Mukti Sangram Samiti (KMSS) on September 13. A team of Dibrugarh police arrested Akhil in response to an FIR (number 180/17) lodged at the Moran police station on September 13 morning against a public speech made by Gogoi a day earlier. At that particular public rally Gogoi said the time has come to take up AK 47s against the government instead of the “hengdang”, a traditional Assamese sword used by the Ahom army for defence. His statement came in response to the BJP government’s amendment to the Citizenship Act to grant Indian nationality to Hindu Bangladeshis, non-implementation of the 1985 Assam Accord by the Central government and dearth of constitutional safeguards to protect the rights of the indigenous people.